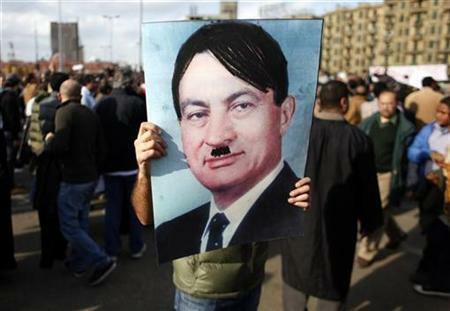 Mubarak as Tyrant Copycat? Planned Chaos to Divide and Rule? Suddenly, serious violence reigns in Egyptian town centres including Cairo and Alexandria as clashes between pro- and anti- government factions escalate and more than 611 people are injured, many seriously, in less than a day. This is raising alarm in international circles. 3. National petrol and petro-chemical company employees. Remember Hitler's brown shirts in the 1920s and early '30s? Further, some so-called "pro-Mubarak supporters" sent in to start the chaos had to be threatened into doing so. Does this not show how desperate the Mubarak regime has now become and how little support it really has left? By all accounts it would appear that Mubarak has unleashed the 'chaos' he was warning Egyptians about as the only alternative to his autocratic regime. Mubarak's thugs are the ones who appear to have run riot in the centres of Cairo, Alexandria and other towns, attacking peaceful anti-government protesters with stones, knives and fire bottles. Mubarak's 'planned chaos' could be a pretext for a still bloodier intervention in the near future. Is the military able to take decisive action to halt the instigators of violence or will it remain passive? As the violence escalates, something bigger may be unfolding.